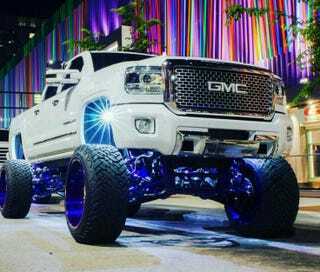 I was followed on the highway by a lifted truck very similar to the one in the picture on the highway a couple of nights ago. I was blinded by the aftermarket projector beam headlights due to their elevation and increased intensity, of course, but was amazed when the vehicle finally passed me and I saw the wheel arch spotlights. Really highlighting the modifications because of excitement about them, I guess. I realize I should not have been so amazed.